Carol Dweck is quite clear on the concept of rewards. All learning must ultimately be based on learning for learning’s sake. This can be put into context/relevance for individual pupils by using aspirational goal setting. I believe that there is merit in growth mindset rewards, especially for pupils who have difficulty accessing a Growth Mindset attitude, i.e. low self-esteem, learning or SEN needs, as well as attendance or behaviour issues. To make pupils more intrinsically motivated, extrinsic growth mindset rewards, such as stickers and certificates, should be used alongside aspirations and role models, as well as support from parents. Avoid giving person-orientated praise i.e. 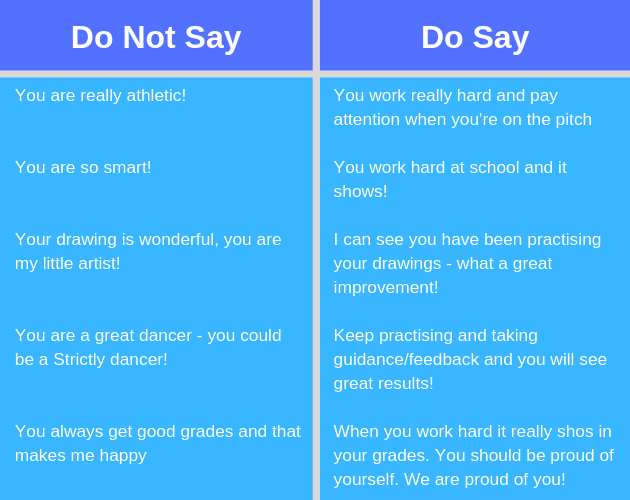 ‘I’m proud of you,’ or ‘you’re good at this.’ This assumes that success is due to set personal attributes and teaches pupils to interpret difficulties in terms of their personal weaknesses. Rather, give process-orientated praise. This focuses on the process required for success. For example, praise their effort, challenge (metacognition), resilience, etc. as this emphasises striving for success. Feedback should be given in terms of needing more or different components of GM, i.e. Challenge, Effort, Practice, Feedback, Resilience. Some relatable work has been done by Sharon Silver (2016) on Global vs. Specific praise and feedback. Global praise refers to generic praise, whereas specific praise zooms in on a particular quality that has been developed. Equally, feedback needs to be immediate, accurate and involve some interpretation by the pupil. This can be evidenced by teachers placing a score on a piece of work and asking the pupil to demonstrate why this score was given (perhaps using a reference grid at the back of exercise books or displayed in the classroom). But be careful; pupils tend to focus on scores rather than written comments. Hymer & Gershon (2014) state that feedback and praise should be information, future and behaviour based. This may well be a simple yet effective way of allowing pupils (and peer evaluation) to be used in a classic GM way. Finally, language and metaphor are crucial in achieving a GM message. For example, state the problem as a challenge, or an opportunity to learn and to stretch yourself, rather than as a weakness. Metaphors can be a journey of learning. The journey starts with one small step; how do you eat an elephant? One bite at a time! Ideally, try to allow pupils the opportunity to create their own metaphors (cross-curricular English) so they own their learning. 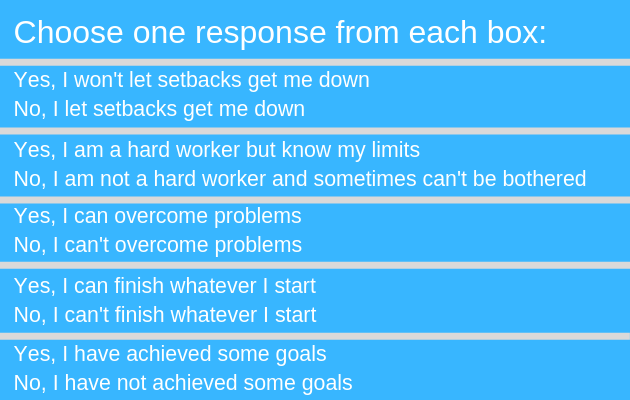 One measure of Growth Mindset has been widely adopted and adapted from Carol Dweck. It is based on 4 very similar questions (some adaptations include 20 questions). There is a spectrum ranging from 0, which shows a fixed mindset, to 16, which is a growth mindset. This can be used pre, mid and post-growth mindset coaching, for self or peer evaluation. Similarly, Angela Duckworth talks (2007) about the concept of grit and how we must demonstrate this quality over years, not months. Learning and success are a marathon not a sprint and careful praise is needed. But, crucially, how do we unlock what motivates a young person to learn and make progress? Each yes equates to 20% and a maximum total is 100%. For those pupils who are having difficulty accessing a GM state, then there may well be barriers associated with self-esteem, confidence, negative peer or home influence, and aspirations. 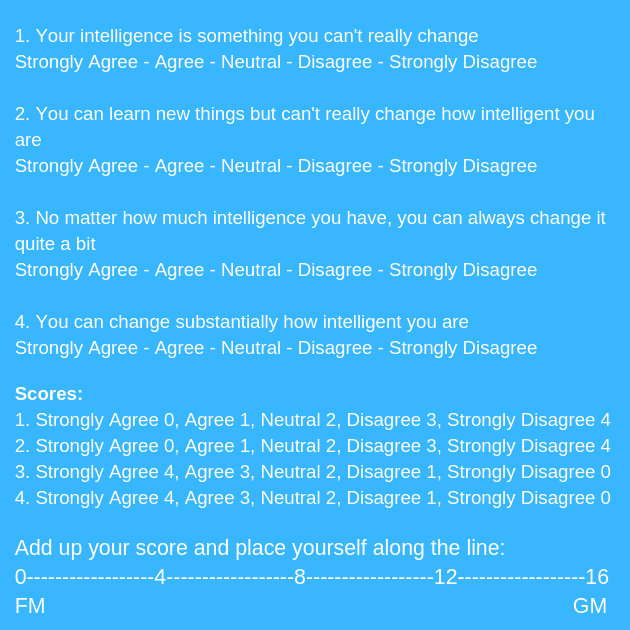 I have created the CUPPA Challenge which uses 10 simple questions to assess confidence (age appropriate 10-12). Find out more about CUPPA here. Beyond these measures, your school could also consider other measures based upon attendance (improved), rewards (increased number), sanctions (decreased number/severity), grades (higher) school/class attitude (appropriate indicators). • Duckworth, A. L., Peterson, C., Matthews, M. D., and Kelly, D. R. (2007). Grit: Perseverance and Passion for Long-term Goals. Journal of Personality and Social Psychology, Vol. No 92pg1087. • Dweck, C. (2012) Mindset: How You Can Fulfil Your Potential. Robinson Publishers. New York. • Hymer, B. and Gershon, M. (2014) Growth Mindset Pocketbook. Teachers’ Pocketbook Publishers. Alresford, Hampshire. • McWilliam, R. (2016) The Amazing Journey of CUPPA – His Quest to Find the Five Secrets of the Confident Mindset. Self-Published Amazon. • Ricci, M.C. (2013) Mindsets in the Classroom. Prufrock Press. Waco, Texas. In Part 1, Ross provided guidance on how to help pupils to understand the concepts of Growth Mindset and how to develop their own definition of GM. Read Part 1 here. We’re springing into April with lots of new products, designed to make your teaching life easier. Take a look at our school stamps, stickers, star charts, value packs and much more in the latest blog. With the clocks going forward and gardens full of daffodils, it is clear that Spring is finally here. Why not try some of our spring activities in your classroom and make the most of this brilliant season?